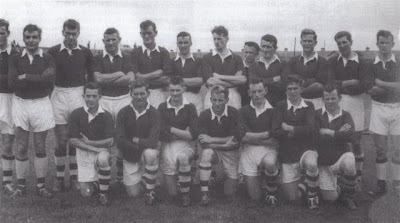 On Friday next at the Edenderry GAA Awards evening we will be acknowledging the great achievement of the 1957 winning Senior Football Team - 60 years on. In 1957, Edenderry qualified for their fourth County Final in the fifties, having previously won it in 1951 & 1953 and beaten by Durrow in 1952. Edenderry beat favourites Daingean in the Semi Final on a score-line of 3-4 to 1-9 with goals from Sean 'Hooper' Farrell (2) & Michael Nolan. A young Tommy Cullen was a revelation in the game despite having played a Minor Hurling match earlier in the day. The Reds eased to their 4th ever County Title ever with a comfortable victory over Clara in the 1957 Final. An early goal from Pat Nolan was followed by one each from Sean Hooper Farrell & Paddy Fenlon to leave the Reds leading 3-4 to 0-1 at the break. Only two points were added to the tally in the second half as the Reds strolled to victory. Little did anyone think it would be 28 years until the Red won another title particularly as they dominated the decade. Unfortunately many of the great Reds are gone to their eternal reward but we hope to have some members of the squad with us on Friday night to remember their great days.